Lokmat Media Ltd, the regional newspaper of Maharashtra organized a social media campaign titled ‘CM for a Day’ on August 21, 2013. This campaign gave users an online platform, on which they were asked to share solutions of the various problems crawling in the state today. 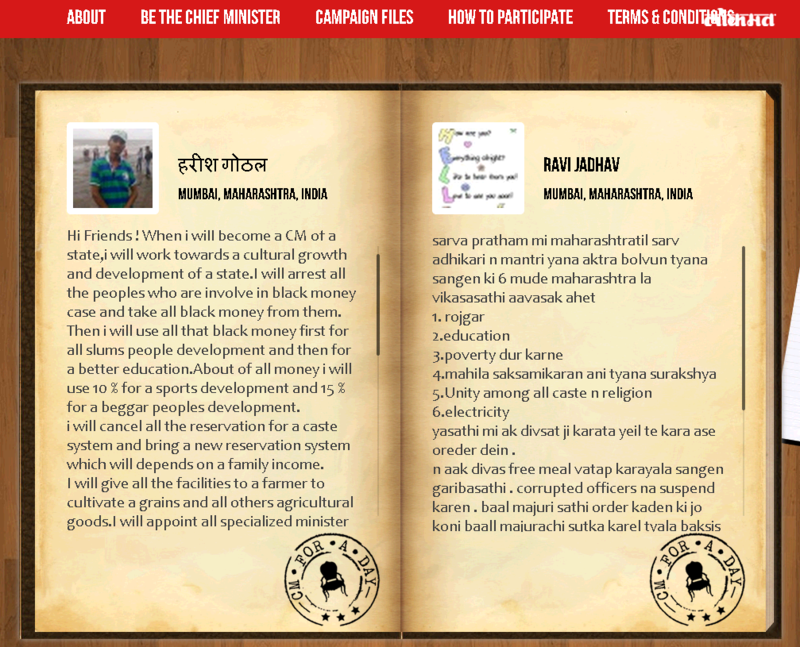 They set forward this campaign with one simple question– “What would you do if you were the CM for a day?”. 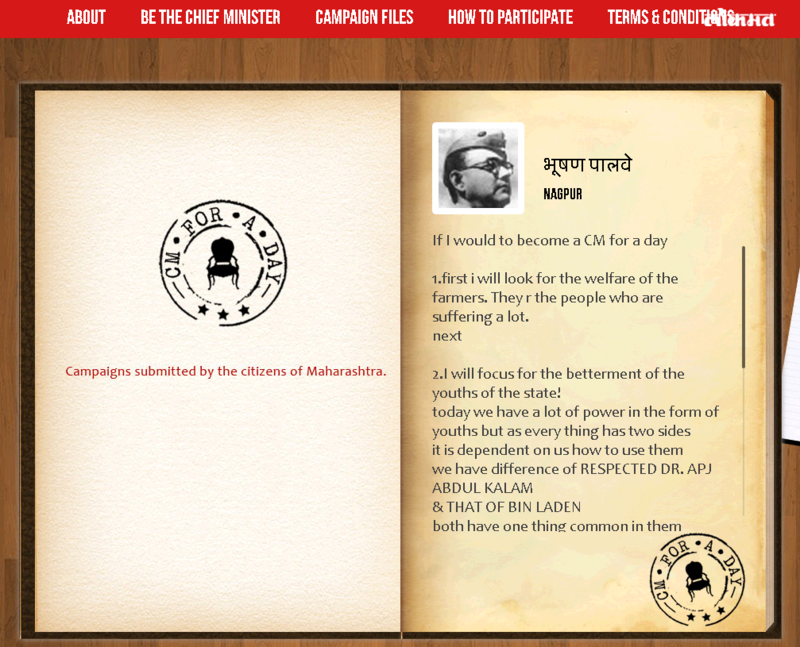 The campaign gives its fans a special micro-site to share their thoughts and ideas, on how the governance of the state of Maharashtra could be made better, with fans being given the chance to discuss their plan of action if they became CM for a day. This campaign gives an opportunity to Lokmat to establish themselves as an awareness brand. Being a media company, they are entitled to inform people about real time news and the issues bothering the state. A sense of understanding is built as a result of this campaign, along with an effort to gain their trust. This campaign is a way to gain loyal followers who, in the coming future will fetch them more followers based on mouth to mouth publicity. Campaigns of this type are very frequently done by other newspapers. Through this, Lokmat is also trying to become one of the leaders of news reporting. 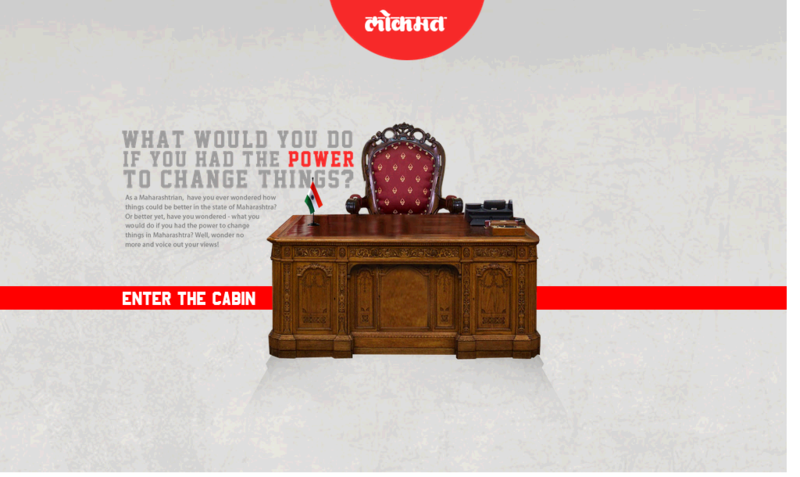 Lokmat created a dedicated micro-site for the execution of this campaign, which could be reached through the Facebook custom tab. The application on Facebook leads you to the microsite. The name of the participant is pulled from the Facebook profile and generated on the desk nameplate. Users need to click on the pen to start their own campaign. Post this, users can fill in the notepad and sign it. After the completion and submission of your campaign, a pop up on the screen allows users to share it on their Facebook wall. 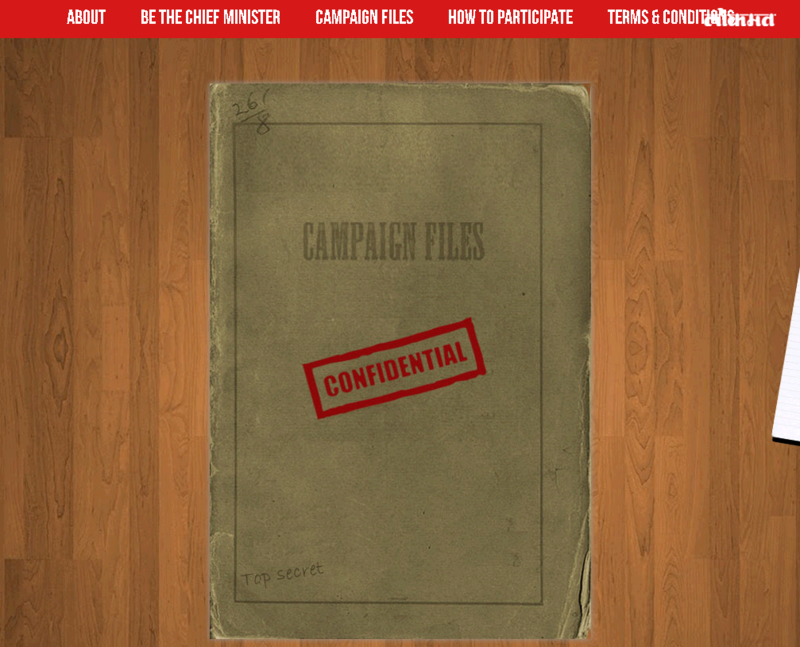 The participants are then allowed to view the ‘campaign files’ of other participants. The campaign was promoted at intervals on Facebook, with good user interaction being observed. On Twitter, however, the campaign was not promoted at all. Only 1 tweet went out on the day of the launch. The best entry was given a chance to win a day with the editor of the Lokmat newspaper, along with a visit to the Lokmat printing press and a Croma voucher worth Rs. 2500. 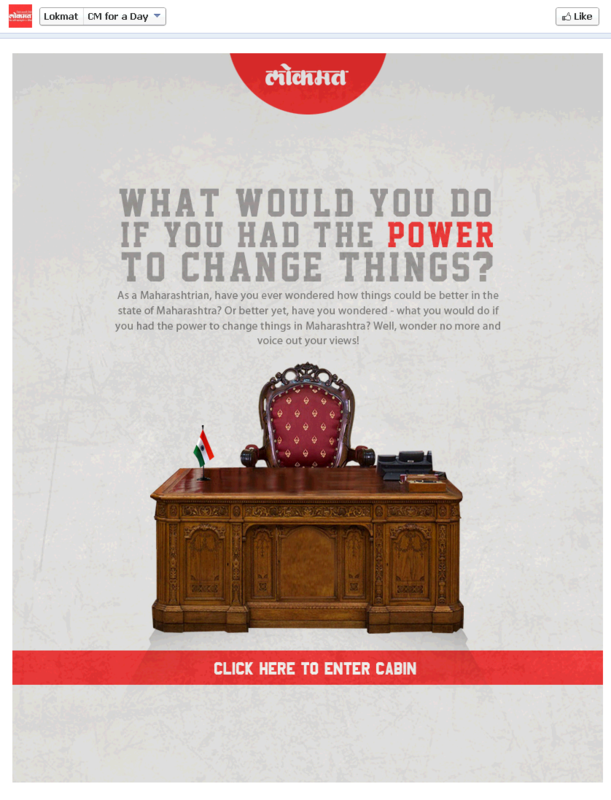 The micro-site made by Lokmat for the promotion and participation for this campaign is incredible. The entire layout and focus of the micro-site is appealing and delivers exactly what it promises. If you’re a participant, then the micro-site will definitely increase your excitement. The site piques your curiosity towards the other campaigns and makes you want to read the views of other participants. While reading these campaigns, as a citizen, one will be able to relate to the content shared by other users.The entire campaign empowers the online users to be at a powerful post. For participation in this competition, one needs to like the Facebook page of Lokmat since the application has a like-gate, which increases their visibility to other unknown users. The concept of sharing one’s respective campaign on their Facebook wall adds to the success of the campaign. Lokmat announced this campaign on social media platforms, namely Facebook and Twitter, though it seems like they have completely forgotten about the latter. 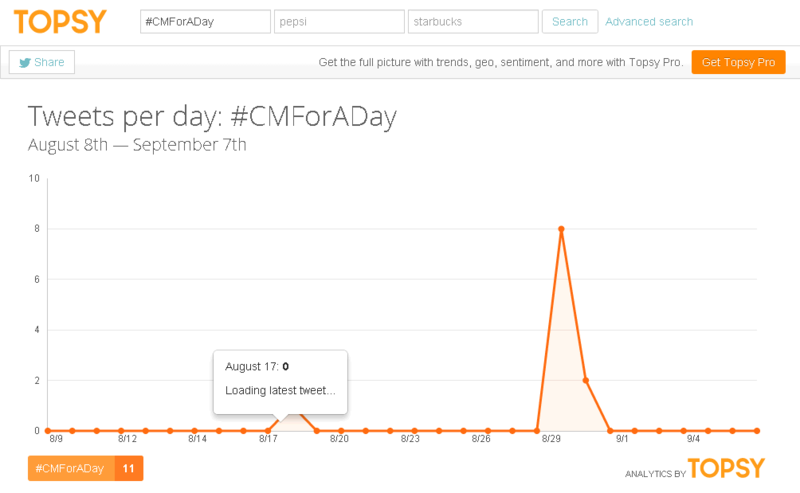 When we searched for the hashtag #CMForADay, we find zero user interaction and negligible brand tweets on Twitter. They also have not leveraged Facebook in a proper manner. With a fan base of 2 lakh people, regular updates about the campaign could have increased interaction. The Facebook posts do not use the hashtag feature, and are also not as many as we would have preferred. The concept is huge and a lot of people can easily relate to it. The presentation of the micro-site is dazzling. However, its sad to see that they have not promoted the micro-site well on their social networks, which could have doubled the results. 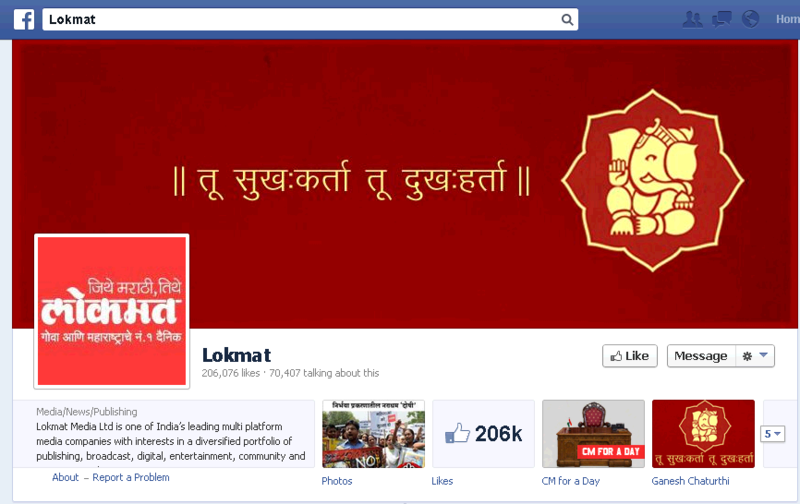 Overall, Lokmat has taken a good initiative, but they should try and take it to another level.